Note: I am assuming that before reading this page you are familiar with the idea that some people think NASA faked the Apollo Moon missions. If this idea is new to you, try reading my page with links to other pages about the Moon hoax, and my page debunking specific claims of this hoax "theory". One of the more active proponents of this silliness is one Bart Winfield Sibrel. He claims to have been a journalist (although he actually was only a part-time editor at a local Nashville NBC affiliate for a couple of months, and "he has no right whatsoever to claim any association with our news organization" according to the news director there, according to this news article: note that this is a pay-per-view article service). Actually, he claims a lot of things that turn out not to be true (and, in fact, lied on national TV about me during a "debate" on MSNBC; go down about 2/3 of that page to a post I made about this). He created a "documentary" called "A Funny Thing Happened on the Way to the Moon", which he claims is full of evidence the landings were faked. In reality, his claims are completely wrong. His evidence is either grossly misinterpreted by him or just plain wrong. In the links at the bottom of this page, you can find details about both Mr. Sibrel and his ridiculous video. He is certainly a publicity hound. He has been known to stake out Apollo astronauts and then leap out, asking them to swear on a Bible that they did indeed walk on the Moon. Why would he do this? If they do swear, what does he say? Apparently nothing, because Apollo 14 astronaut Edgar Mitchell says he did indeed swear on a Bible for Mr. Sibrel, yet there is no mention of this in Mr. Sibrel's website or video. And if they don't swear, of course, he can claim it's because they are liars. Sometimes making that kind of claim can get you in trouble. It certainly did with Buzz Aldrin. Mr. Aldrin, the second man to walk on the Moon, was ambushed by Mr. Sibrel with the Bible trick. On September 9, 2002, Mr. Sibrel jumped out at Mr. Aldrin with the Bible, daring him to swear on it. Buzz told Mr. Sibrel to go away repeatedly, and even asked for the police. When Mr. Sibrel physically blocked his path, Mr. Aldrin (who is 72, 5'10" and 160 pounds) punched Mr. Sibrel (37, 6"2" and 250 pounds) in the face. Some say Mr. Sibrel had it coming. I have no comment (though you can leave yours on my bulletin board). But it shouldn't surprise you to learn that Mr. Sibrel wants to sue Mr. Aldrin for attacking him. From what I heard, it's Mr. Sibrel who might be in trouble. Besides asking the court (or a jury) to prosecute a man who is in every sense of the word a national hero, the case can easily be made that it was Mr. Sibrel who stalked and attacked Mr. Aldrin first. If Mr. Sibrel were interested in the truth, he wouldn't try to prosecute, in my opinion, since this seriously undermines whatever credibility he may have. If he only wants publicity, he'll take it to court. This Just In (September 27, 2002): Buzz won't be facing charges. The LA County prosecutor has to be the one to file the charges, and their office declined to press the issue. Mr. Sibrel received no real injury (as the video shows that pretty clearly, since he turns to the camera almost immediately and asks "Did you get that?") and so the prosecutor won't pursue this. One more thing: domain-squatting is the term used when someone buys a domain name that someone else might eventually want. Hopefully, they can then sell the domain name for a nice price. For example, I could buy "www.neilarmstrong.com" and try to sell it to Mr. Armstrong (actually, it looks like someone has indeed done that). So, on September 12, 2002, someone bought the URL www.bartsibrel.com (note added February 2003: the name was bought by someone else, and no longer makes fun of Mr. Sibrel. Interestingly, though, it does say that anyone who claims the Apollo missions were faked is trying to scam people. :-). Take a look at Mr. Sibrel's website promoting his atrocious video. All of the facts he lists there are easily shown to be wrong. After the above link, go to Jay Windley's wonderful website Clavius.org, where he dissects the Moon hoax theory and and Mr. Sibrel's claims in particular. Jim McDade also has a page debunking Mr. Sibrel's silly claims. My own page debunking the Moon hoax. A charming article in the St. Petersburg (FL) Times. 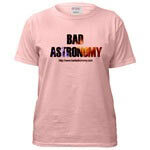 I'll note it refers back to the Bad Astronomy site. An article on the Fox News website about the Moon landings. Halfway down are letters to the author about Misters Sibrel and Aldrin, including a couple from Bad Astronomy readers. The L.A. Times has the video online! It's choppy, but you can see the whole thing. They have several online articles about this event located here, but you have to register (it's free) to see them. A Fox News article, which, very ironically, links back to this very website. You can also read peoples' comment on the Bad Astronomy Bulletin Board's Lunar Conspiracies forum.